Solar reflec­tive shin­gles and solar reflec­tive roof­ing mem­branes can be an impor­tant com­po­nent in a build­ing sys­tem designed to reduce over­all build­ing energy con­sump­tion and the impact the home or build­ing has on the environment. Solar reflec­tive shin­gles are defined as hav­ing sur­faces that pri­mar­ily reflect con­sid­er­ably more IR radi­a­tion than nor­mal roof sur­faces. Infrared radi­a­tion is a spec­trum of light that gen­er­ates sig­nif­i­cant amounts of heat on roof sur­faces. Solar reflec­tive shin­gles are designed specif­i­cally to reduce the absorp­tion of the suns infrared radi­a­tion by reflect­ing IR rays off the sur­face of the roof thus not allow­ing the heat to be trans­ferred to the inte­rior of the struc­ture (i.e. the attic under the roof). By reduc­ing the amount of this heat trans­fer, solar reflec­tive shin­gles and solar reflec­tive roofs in gen­eral have the abil­ity to keep build­ing inte­ri­ors cooler, thus less­en­ing the usage and strain on HVAC equip­ment par­tic­u­larly in warmer cli­mates and in sum­mer months. In addi­tion to the poten­tial energy sav­ing ben­e­fits that solar reflec­tive shin­gles can have for a build­ing, research on the degra­da­tion of roof­ing mem­branes over a num­ber of years have shown that heat from the sun is one of the most potent fac­tors impact­ing dura­bil­ity. 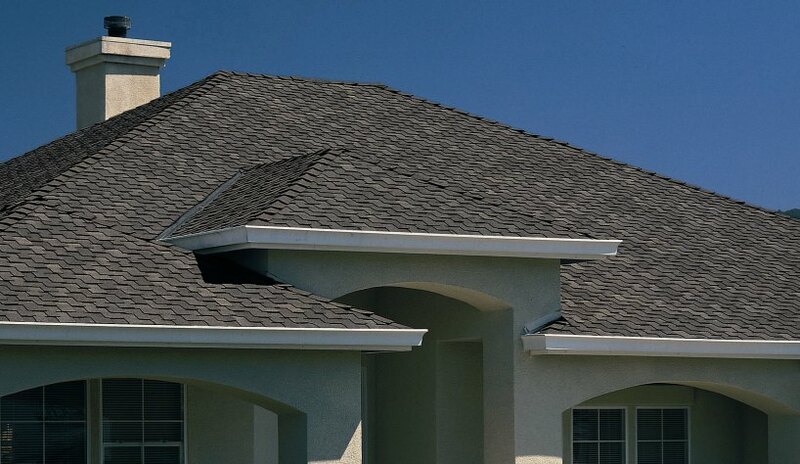 High tem­per­a­tures and large vari­a­tions; sea­son­ally or daily, at the roof­ing level are detri­men­tal to the longevity of roof sur­faces. Reduc­ing the extremes of tem­per­a­ture change will reduce the inci­dence of dam­age to roof­ing sys­tems. Using solar reflec­tive shin­gles and solar reflec­tive roof­ing prod­ucts that reflect ultra­vi­o­let and pri­mar­ily infrared radi­a­tion will reduce dam­age caused by u/v and heat degradation. Cer­tain­Teed Cor­po­ra­tion has sev­eral solar reflec­tive shin­gles to choose from in var­i­ous style and color options to suit a range of dif­fer­ent home styles and elevations. The Land­mark Solaris series of solar reflec­tive shin­gles, which fea­tures the Solaris Gold and Plat­inum col­lec­tion, is avail­able in sev­eral pop­u­lar ENERGY STAR® rated color options, which are vir­tu­ally indis­tin­guish­able from the Cer­tain­Teed Land­mark shin­gle that has recently been rated a con­sumer “best buy” from a highly respected con­sumer pub­li­ca­tion. The Solaris Plat­inum solar reflec­tive shin­gles rep­re­sent an indus­try break­through in tech­nol­ogy achiev­ing a level of 40% solar reflec­tiv­ity, by far the high­est level of reflec­tiv­ity in the asphalt shin­gle industry. The Pres­i­den­tial Solaris series of shin­gles fea­ture solar reflec­tive roof sur­faces that achieve ENERGY STAR® stan­dards but in CertainTeed’s thick, rich Lux­ury styled shake replace­ment shin­gle. As with Land­mark Solaris Gold shin­gles, Pres­i­den­tial Solaris shin­gles are vir­tu­ally iden­ti­cal in appear­ance to the same shin­gles with­out the solar reflec­tive roof­ing surface.